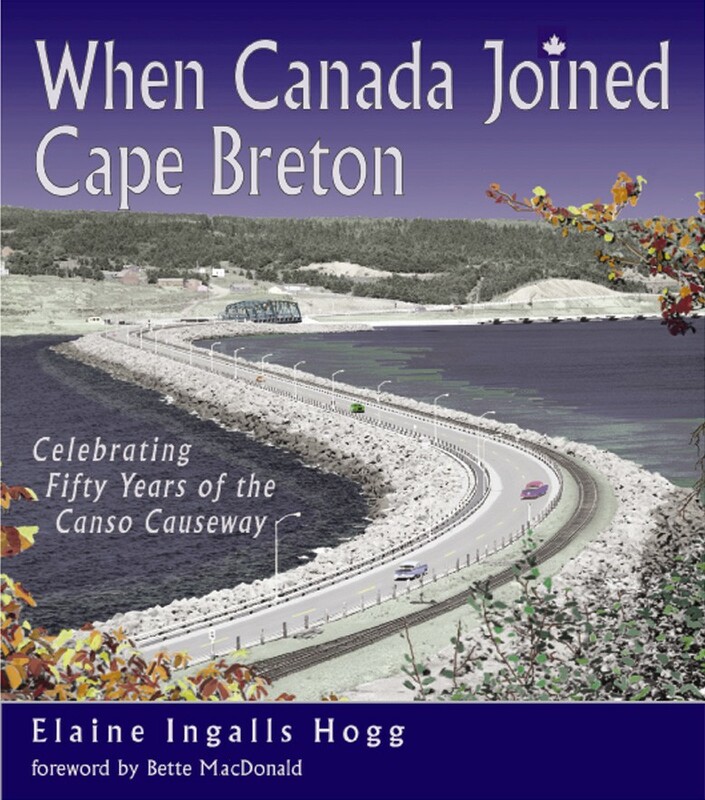 On April 10 and 17 The Halifax Herald listed When Canada Joined Cape Breton as the # 1 best seller in Nova Scotia for the previous week. "You're famous!" I had to smile at my nine year old grandson's conclusion. We had been looking at a scrapbook I'd put together containing newspaper interviews and press releases for my recent book, When Canada Joined Cape Breton. In reality I'm far from famous but some amazing things have happened since the morning a few years ago when I told myself, "I'll never know until I try." I haven't attended very many book launches but when it came to mine, I did know one thing, I didn't want it to be a hum-drum event. The completion of my book took three years of work so it deserved to have proper planning. I wanted it to be a celebration of, what to me, was a major accomplishment, an event suitable for the occasion when a fifty-something lady's dream of becoming a recognized author came true. I believe the foundation for a successful launch was put in place before the manuscript was ever written. It began when I planned the topic and setting for my story. Three years prior to this I had researched the markets to identify the potential interest in my subject. Once I had the idea firmly in my own mind and was certain there was a marketable niche for the material, I was able to use the results of my research to pitch my idea to a publisher. Since my book was a people's history about a causeway joining mainland Canada to the island of Cape Breton (at least this is how the Islanders feel about the linkage), I felt it was fitting to have the launch in a typical Cape Breton style, that of a ceilidh or 'kitchen party' with music, finger food and invited storytellers. I made up lists of friends and acquaintances and the publisher mailed out attractive invitations with a picture of the book, "When Canada Joined Cape Breton", on them about two weeks before the event. Days before the book was ready to be released I found the Internet to be a valuable tool in promoting its launch. Several years before I had been interviewed by a number of reporters when my first book "Remembering Honey", was launched so I used my search engines to contact the newspaper reporters, radio and TV hosts who had interviewed me in the past. About three weeks before the launch, I sent them a press release and a personal invitation. E-mail also proved to be a useful tool by allowing me to make friends and acquaintances aware of the launch and, after it was over, to send thank-you notes to many of the people who attended. One other use of the Internet, besides indicating the day and time of the ceilidh, was posting a review of my book, my bio, a picture of me and one of the book's cover on the front page of my website. Consequently, this provided potential interviewers with valuable background information when planning an article. Despite the many preparations, I still went to the launch feeling as though I was wearing too much skin, over exposed and wearing only my underwear. "What if no one comes?" the thought kept running through my mind. After all, I was a CFA (Come From Away) writing about the history of an event precious to the memories of the local citizens. "What if they don't like the book?" But I needn't have worried. People started lining up at the door half an hour before the announced time and never stopped until the room was packed to overflowing. It was with great relief when the evening was over and I heard, "It's our most successful launch to date!" What better words could I have heard at the end of a busy book launch? The only ones I can imagine are, "At this rate we'll have to do a reprint by Christmas." Actually, both of these sentences were said last April 1 by the managing editor of Nimbus Publishing after the launch of "When Canada Joined Cape Breton". Before the evening was over more than 200 people turned up for the launch (In a town of about 3,500) and 210 books sold that night while another 100 sold at the bookstore on the weekend. Until the book became a reality I felt like the little train that kept saying "I think I can" and with the help of many encouraging people, I did it!. The book has since gone on to become #5 on the publisher's best seller list for 2005. As a result of the strong sales, the publisher has approached me to edit and compile another book in a similar style which will be launched this fall.